Christopher Hamilton is a Professional Grade piper, a EUSPBA adjudicator, instructor, moderator at the BobDunsire.com forums. Below, Chris explains how to use the Korg CA-30 Chromatic Tuner to tune bagpipes. 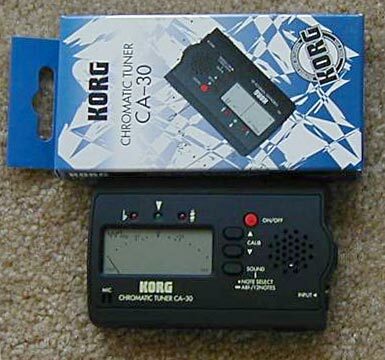 The Korg CA-30 tuner, while not designed for bagpipes, can be used for tuning pipe band drones and 'Low A's quite effectively. Here is the method that I've developed over the past few years. 2. Initially, the standard frequency will read 440 Hertz (Hz), or cycles per second, at this point. This does not mean that B-flat is 440 Hz, but rather that the B-flat is relative to an A of 440 Hz. Therefore, the B-flat is 467 Hz. (this "+27" formula will tell you your absolute pitch of Low A with these things). 3. Hold the meter up to the outside tenor of the well-tuned master pipe, and repeatedly push the Up or Down Calib buttons until the Green LED lights steadily (and the red sharp/flat lights stop) and the needle is locked at 0 (zero) cents (the deviation from the master pitch). In the right corner of the screen the note "heard" will be displayed. This will typically be "Bb" (B Flat). The number displayed in the left corner of the display screen (say 448) is of the note Low A (which is akin to Bb) relative to standard A. So if it's 448, you add 27 and know your Low A pitch is 475 Hz. Now, if the note displayed on the screen says "A", then the number on the left side will typically be in the 470s range. If this is the case, then you don't need to do any conversion mathematics. At any rate, the important thing is the calibration to "0" (zero). Note that unlike the CA-20, there are Up and Down calibrate buttons! The unit will calibrate from 410 Hz to 480 Hz. Note that the tick marks or increments on the screen are in 5-cent increments, which *roughly* correspond to 1 Hz in this frequency range. Unlike the CA-10, when you turn the power off on the CA-30, it "remembers" the last pitch you used and will display that as the standard when you turn it on again. Unlike the CA-20, there is no "Auto" or "Manual" button - it's all automatic.